The olive tree is an evergreen tree that gives shade when farmers till the land. It lives longer than the other trees in the area. You can hear old men saying, “this olive tree is rominyyeh,” meaning it was planted during the Roman occupation. Ramallah, my second home from 1949-1967, was surrounded with terraced hills full of fig trees. Olive trees and grape vines. Those hills are now lost to Israeli settlements and roads. 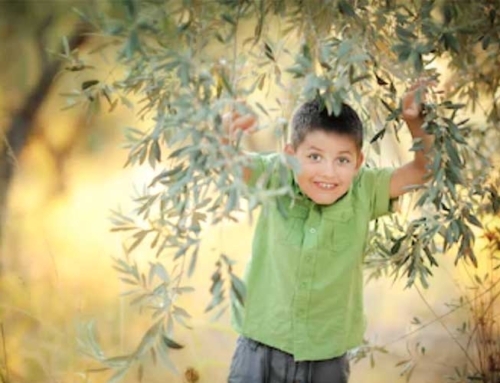 Before, all families owned olive trees in ample amounts for their daily meals and other uses. Most Palestinian families eat olives three times a day. There is always a plate full of different kinds of pickled olives, green, black, brown, unpitted, whole or crushed, big, medium of small depending on the areas and the soil. It is home-pickled with water and salt or olive oil. The main breakfast is tea drunk with a bread dipped first in olive oil then in a mixture of thyme and spices with sesame. A big pita loaf or loaf soak with olive oil mixed with thyme, salt and sesame is the cheapest filling meal you may get when you are hungry, something even a poor farmer could count on before the occupation and the arrival of the bulldozers. When baked it is delicious. Our soap was also made form olive oil, a craft I remember learning in my home economics classes. After the oil is pressed, the pulp that remains is used as animal feed. When necessary, the residues of the olive processing are used as fuel for heating or baking. A bread winner and a mother at home would fee secure when they had their annual supply of olive oil (zeit), olives (zatoun) and thyme (zatar). We should not forget that the olive branch was the first sign of life that the dove brought back to Noah’s Arc to hale the end of the flood as the biblical story goes. It is only a symbol o peace by a sign of livelihood as well, especially for the Palestinians. Nahil Aweidah is Palestinian woman three times displaced (Jerusalem, Ramallah, Beirut). She now lives in Canada.